It has been months since we have posted anything! Things have been so busy and only seem to get worse. We have still, however, been working very hard and can now see the end of the process. Most of the sections are done and we are just struggling to keep them reviewed and in the dancers bodies. Our goal is to have the last two group sections completed by the end of October. That will give us a couple of Thursdays in November to tie up loose ends and Saturdays we will work to put the whole dance together with transitions. Itâ€™s very exciting! Working each Thursday and Saturday has been rewarding, wonderful, and totally exhausting. From all of our other jobs, RawMoves meets up to tire ourselves out even more. We push through and try to make as much progress as possible each rehearsal. Our dancers have been beyond tired, emotionally exhausted, and injured. It’s often hard for us to push forward when these wonderful people are donating their time. It would be wonderful to give everyone the night off and take care of ourselves; however, we need to finish! For our past shows, we have never given ourselves time to review, rework, and re-evaluate. Usually, we are finishing choreography the week before the show. If we didnâ€™t have to do that this time around, that would make us SO happy! Who knows, maybe this will be the last project where our dancers will have to donate all their time. We are so excited to announce that we have FINALLY been approved by the IRS as a non-profit organization. This means we can now apply for grant money and receive donations from private sponsors and foundations. It also means a lot more work for us, but we are very happy and excited. Many new sections have been started and found their way to completion. One of our favorite sections started out with five women and three sport coats. The music is up beat and has some great rhythms, which thanks to Tosha, led to some great choreography. As is always the case, one rehearsal later our quintet became a quartet and a new dancer was added. Things at RawMoves are constantly changing. No matter how hard we try, our plans never seem to last more that 24 hours. You’d think we’d figure it out and stop planning so much, but we don’t. And we keep getting frustrated by it all. People probably don’t understand how much of our process is dictated by unplanned events. We can start of with a very clear idea of what we want but, soon enough, that idea is gone because of conflicts, problems, or unforeseen scheduling issues. 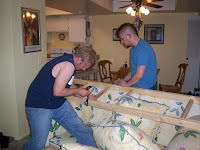 After working like this for years, we have learned to be very easy going and to roll with the punches. In fact, our second or third plans often end up stronger than what we started with. That certainly seemed to be the case with the new quartet. With the changes in cast and structure, we were able to find something that is creatively much more interesting than what we produced during our first rehearsal. From all the obstacles and diversions we deal with, our creative process seems benefit and has become much more fluid, open, and malleable. Our most recent work has been with seven of our eight dancers. 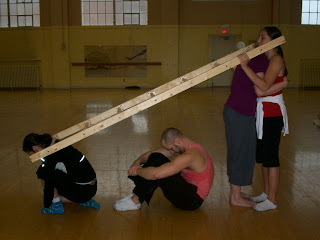 Using the wonderful ladder that Josh so nicely built for us, we set out to create a sweeping dance using the ladder in many different ways. This process was more complex than we thought it would be; for the dancers as well as us. We were able to use the ladder as an architectural element – bisecting groups of dancers and creating lines in space that framed the choreography. All in all, we are VERY happy about this section! Once there were 10 monkeys in a bed and the smallest one said, “I’m crowded, roll over.” So they all rolled over and one fell out. We had a blast today working with seven of our eight dancers. The basis for this section the rhyme above. Using a large gymnastics mat, we create our own bed. It was really fun working with a group of dancers in and on a confined space. It gave us an opportunity to layer the dancers in smaller groups and over lap the movement ideas to create a complex picture. Personally, it was a really good working day for the two of us. We were finishing each others sentences, again, and thinking the same thoughts at the same time. This doesn’t always happen but when it does – DAMN! Things just seem to flow so nicely. Also, the movement quality, our ideas, and the musicality fit without us having to put too much effort into it. All in all a very good day! Here is a visual diary of what we’ve been up to! So far we’ve been working on the pillow fight and a really fun duet with Nathan and Rosy. That duet we are calling ‘Leash’ and has the two dancers partnering with each other and 10 foot length of rope. Nathan and Rosy dance and tie each other up during the duet, ending with it around Rosy’s neck like a leash. Got to go look at the solo Tosha has been working on, so this will have to do for the ‘catch-up’ session. We’ll post more on YouTube when we get some time! Sorry this is late! We have had a busy couple of days. That, and the following blog, was written almost two weeks ago! Oh my goodness, how busy we have become! I am sitting in rehearsal trying to get caught up on everything while Tosha works with Ursula. The blog is now tardy beyond all reason! While we haven’t been posting, we have certainly been rehearsing. We have a lot to catch you up on! Well, here we go! On Thursday (that would be 6.24), we worked with Nathan and Corinne on a new section. Using a basin turned over, a man’s jacket, and a bouquet of flowers we created a grave. Working on this section, and Nathan’s solo the previous week, we have found ourselves developing movement in a more imagistic way. Our usual level of choreographic complexity has given way to a movement vocabulary that is simple and more basic. We are finding that the movements and steps aren’t the most important thing… it is how the actions are performed and the intent behind them that makes the story. Working on ‘Death’ with Nathan and Corinne, we started with a movement vocabulary that was heavy and weighted. Using each other for support and impetus, the movement needed to be thick and deliberate. Towards the end of the process, we felt that the weighted quality of the movement needed to change and we felt the need for more dynamics. Using movement that was faster, we added some fighting and asked the dancers to struggle with one another until they were tired. Tagging this onto the end of the section, we both felt that it was the right choice; however, it came out of no where. Watching this last addition to the dance changed how we viewed everything that came before it. While the sense of heaviness and weight still seemed important, we now saw that we needed a more gradual build into the struggle and fight. Suddenly, thanks to the end, the beginning made more sense. Our next rehearsal will be our time to ‘rough’ things up a bit. Finding places to add that struggle and to build a sense of tension culminating in the full on struggle at the end. We had our second rehearsal on Saturday. We worked on and finished a solo for Nathan using the ladder. 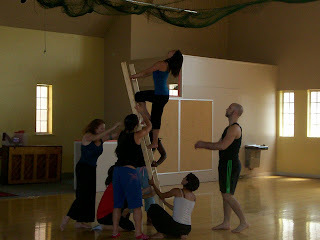 Now, we didn’t have a ladder for rehearsal, but more on that later in the blog! The ladder will rest on the neck of someone standing next to Nathan, creating a small space in which the solo will be performed. The idea was a little boy hiding under the stairs, afraid of the monsters outside. Nathan being the quick study and dancer that he is, we finished five minutes and are pretty happy with it. While generating this movment, it all seemed very empty and blank. Moves without anything behind them just seemed hollow. With each run we were able to see more clearly what we wanted and were able to coach and direct Nathan about the intent behind the movement. For this solo, it wouldn’t be enough to just ‘do’ the movement. Each movement has to have a deliberate intent behind it. Now that the general outline is set, it will be our job to continue to coach him and help him find a deeper place to perform this solo. Here is a small video of the coaching process. At this point, we had finished the solo but were not happy with the phrasing, timing, and tempo of the choreography. Going back over each move, we fine tuned and adjusted what we had already set. So… the ladder. 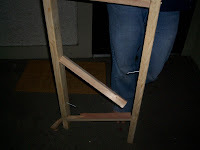 Josh Larson is the NICEST person in the world and offered to help us build a ladder. After dealing with a raining day, we went to Home Depot and discussed several options. 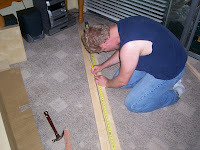 Working on the top floor balcony, with pouring rain rushing over the side of the building, we started to saw, drill, screw, and make a general mess. After dealing with some split wood, we finally finished 95% of the ladder and tried it out. After some standing and messing around, things broke! It was so beautiful before everything crashed. Josh cut his foot (he’s ok) and we have a better idea of what to try next. Hopefully, the ladder will be finished this week! We will wait to show you some of Nathan’s solo until the ladder is ready and part of the dance. It was too big of a file to post here. Every section of this new work will revolve around an object; tonight’s object was a pillow… we took 5 pillows to rehearsal. Add four amazing women and this turned into a pillow fight. We really loved their extreme physicality once the choreography was in their bones. For us, each time we see the section in progress, it reveals more of what is needed. Laying down one simple layer at a time can be a strange process. Trying to watch as a viewer, not as a choreographer, we can sometimes get the sense of a blank space. We see in our minds what is missing; we see in our heads a detail that isn’t there but SHOULD be… There is something very alchemical and mysterious about it. RawMoves is very excited to start work on their next project. While currently untitled, this new evening length dance will revolve around eight objects: a chair, a ladder, a bouquet of roses, a man’s sport coat, a pillow, a mattress, rope, and a basin. Each section will be created using one or more of the objects. Using them as glue and thread, they will become common characters in the story, helping to bind the larger work as a whole. Pairing our dancers in solos, duets, trios, and larger group works we hope to use our signature physical and visceral movement vocabulary to create poetic and vibrant images and experiences. Since its inception, RawMoves has tried to educate and inform our audiences about dance. We have tried to de-mistify the creative act by including detailed program notes and information about our process, ideas, and inspiration. Taking this to the next level, RawMoves is excited to announce the creation of a new online blog, where the creative act and genesis of our new project will be documented. Using video, pictures, and written statements, we will make regular posts after each rehearsal offering a glimpse into our creative process; giving the public an open account of how this work makes its way from our heads to the stage. 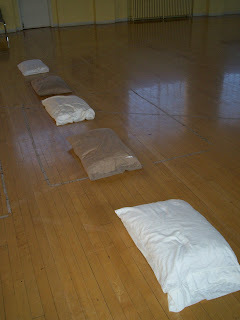 Our new blog can be found here, the official address is www.rawmovesdance.blogspot.com. You can also find a link to it at our web site. We start rehearsals next week and invite everyone to join us as we create this new, exciting work from scratch.